Review – The Good Place – What the fork?! I’m late to the party again – I know! To be honest, I had avoided watching this show on Netflix as the accompanying promotional image looked, well, like another one of those slightly ‘kooky’, American woman things. It didn’t pique my interest enough. Then I watched the first season. Then I watched the first season again with hubby in tow, and we completed the two seasons – watching two or three an evening. A young woman, Eleanor Shellstrop wakes up in the afterlife. She is informed by Michael, that this is The Good Place. It is a Heaven-like utopia, that he designed, in reward for her having lived a good life. Everyone here as done something amazing when they were alive. However, Eleanor realises that she was sent there by mistake and must find a way to keep her true, morally reprehensible past a secret. Enter Chidi – her carefully selected after-life soul mate, who was a moral philosophy professor when alive. 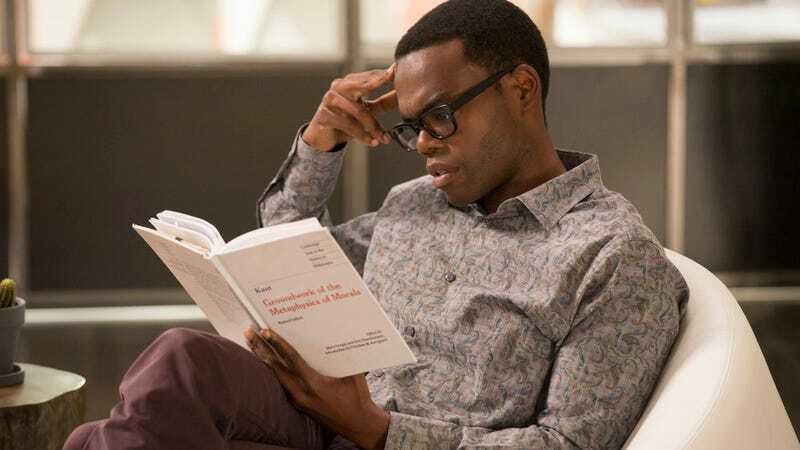 Can Chidi help to improve Eleanor? The Good Place is well-written entertainment, as well as being quite thought provoking – what better way to get people to consider the ethical and /or moral considerations of our actions, than through the use of humour? Michael – means ‘who is God?’. Was also an archangel. Tahani – ‘congratulations’ or ‘best wishes’ in Arabic. Jason – comes from the Greek for ‘healer’. And although it is not necessary; I personally find the origins of names interesting, the selection of these names does add to the overall ‘plan’ of the writer and the show. Firstly, no-one can swear in The Good Place, so Eleanor’s profanities end up as, fork, shirt, dink, ash hole and motherforker. Nah, I’m going to let you watch it and decide for yourself whether you think The Good Place is good, or not?! Posted on April 17, 2018 April 17, 2018 Author AlexandraCategories Reviews, TV/Radio/EntertainmentTags Eleanor Shellstrop Doesn't Belong Here, Heaven, Moral and Ethical Dilemmas in popular Culture, Motherforker!, Netflix UK, Review, The Good Place, Who Belongs in The Good Place?